ARE YOU READY TO TAKE "THE BALLS TO THE WALL"
The "Balls To The Wall" Charity Dodge Ball Challenge is a spirited evening of Dodge Ball play held at BCBA in West Islip, NY. Targeted teams meet every Tuesday from 7:30PM to 9PM to battle it out on the Dodge Ball Court. The Challenge is open to ANYONE with "The Balls" to field a team and hit the court! Maybe your business has been targeted by a rival or another division within your company? Maybe you want to challenge a compeditor or group of co-workers? Maybe some customers at the local Pub wanna take on their favorite bartenders? Whatever your scenerio, take it to the court at BCBA. Bars, Barber Shops, Fire Department, High Schools, Deli’s, Banks, Realtors, Restaurants etc.... the time is NOW to challenge YOUR competition! 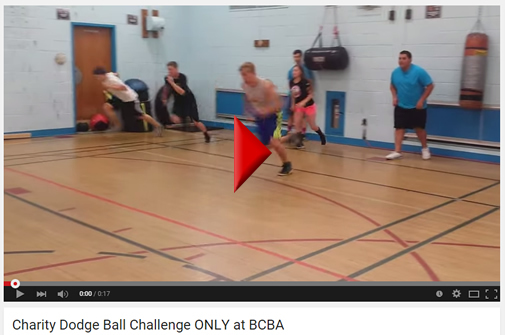 Let's see if they have the BALLS to enter or what it takes to dip, duck, dive and dodge their way to victory! Every Tuesday two teams will meet at BCBA to play. After play ends, the team with the most victories WINS that challenge and gets crowned “King of the BCBA Court”! To enter a team simply sign up at BCBA (registration form available here). Teams MUST have 6 players (18 years and/or over) to take the court. ALL PLAYERS must sign a Waiver. Substitute players are strongly suggested as teams will forfeit their match if a 6 player team cannot take the court. Substitutes are also able to act as ball retrievers prior to live players being called out. SCHEDULE is on a 1st come 1st serve basis so register TODAY! *Times, dates, specifics subject to change as they are based on participation. Visit official Rules page for updated specifics, prizes and details. Proceeds from this exciting challenge go to support BCBA and its D.R.I.F.T. Youth Empowerment Programs. BCBA, a recognized ALL VOLUNTEER 501(C)(3) nonprofit youth organization (Community Boxing Center, Inc.). Since 2004 BCBA has been serving Long Island's youth by providing them with a variety of sports and fitness programs designed to combat childhood obesity and promote positive self-esteem. These programs follow the tenets of their D.R.I.F.T. Youth Empowerment Curriculum (Devotion, Respect, Integrity, Fairness & Temperance). These basic principals stress self reliance and empower kids with structure and discipline so they are prepared to go on and become Champions in Life! The Charity Dodge Ball Challenge offers a fun and fit way you can help this terrific community based charity and the work they do.